Part of the Vineyard’s architectural charm is its many and varied colorful, exterior, wooden window (and door) shutters. 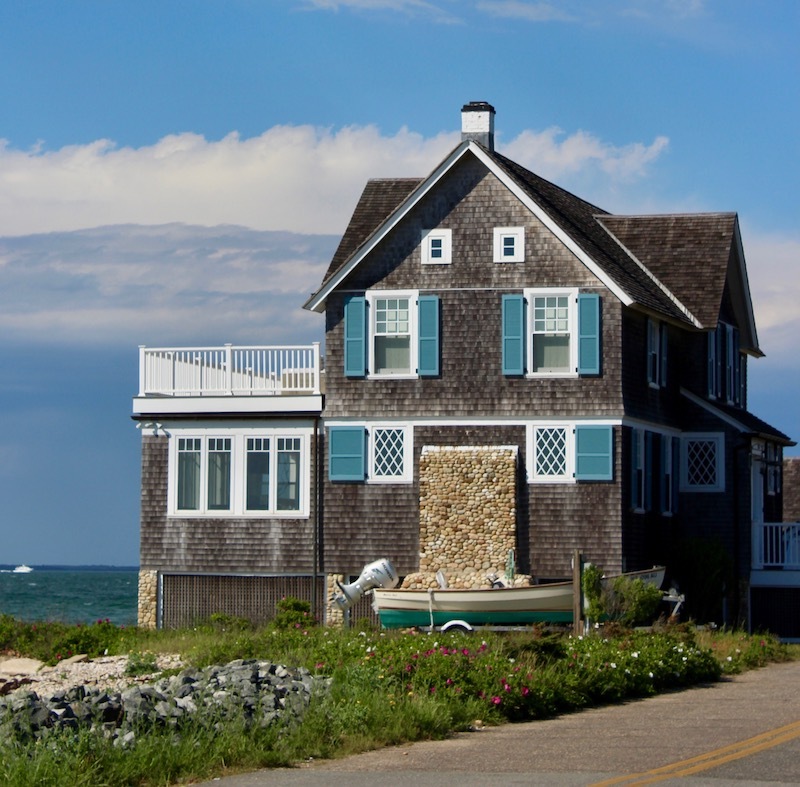 Done right, they add authentic appeal to the Island homes they grace. 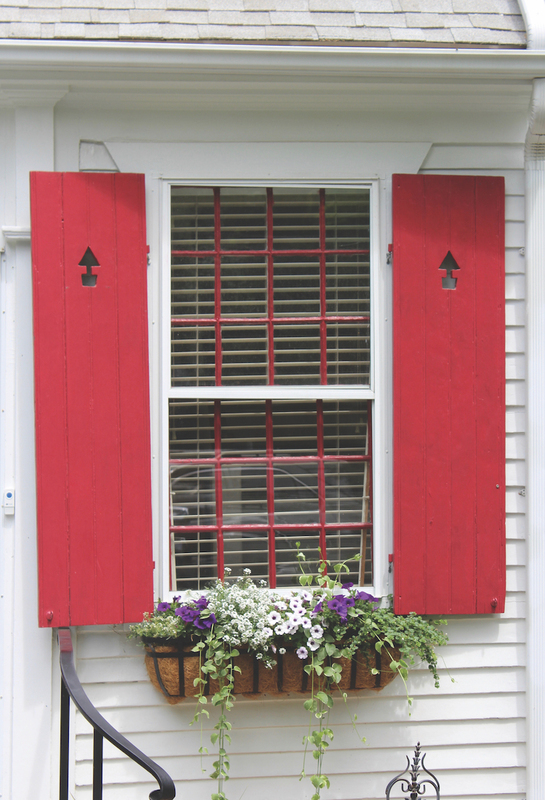 Homeowners and passersby alike can delight in well-designed, well-chosen shutters. Shutters that function can provide protection, privacy, and/or ventilation. When not functioning, shutters should, ideally, appear as if they could. Yes, there is a right and wrong way to size, detail, and mount shutters. 1. The second-floor shutters on this in-town house demonstrate shutters in use on one window and three windows with shutters that appear as if they could be used. 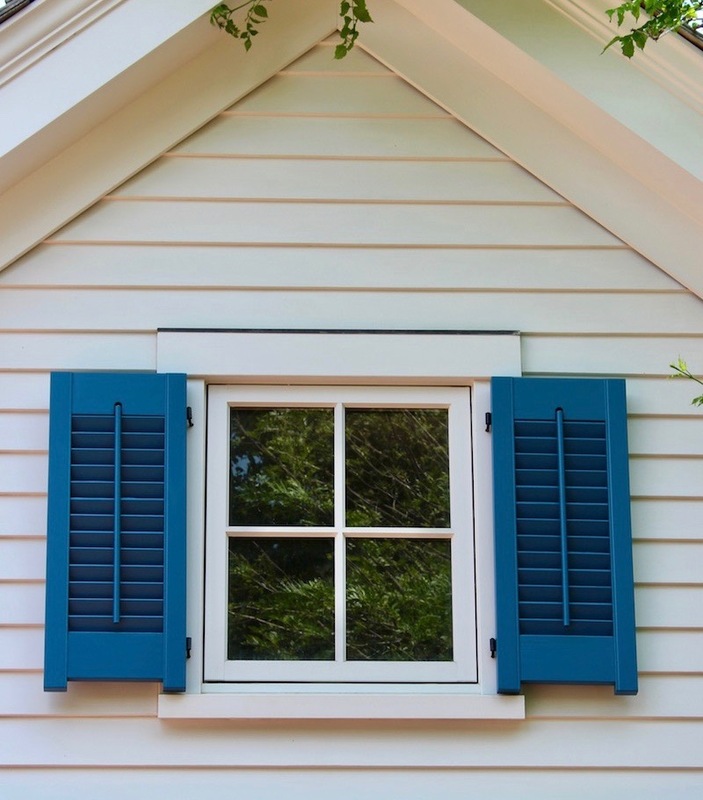 As shown here, shutters should be sized and mounted so that when closed they completely cover the window they serve, filling the opening above the sill and inside the casings. 2. 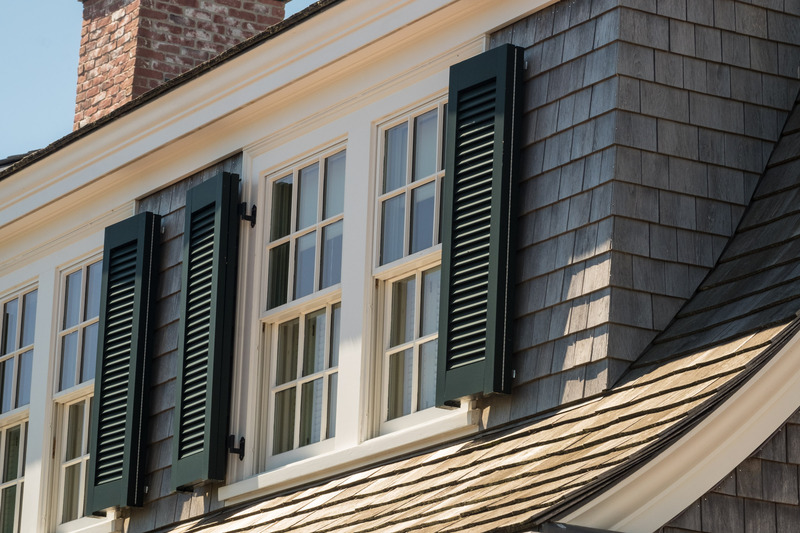 Historically, louvered shutters were used on upper-level floors to provide both privacy and ventilation for bedrooms. The center tilt rod on these blue shutters suggests that the louvers can be adjusted for optimal shade, privacy, and/or ventilation. 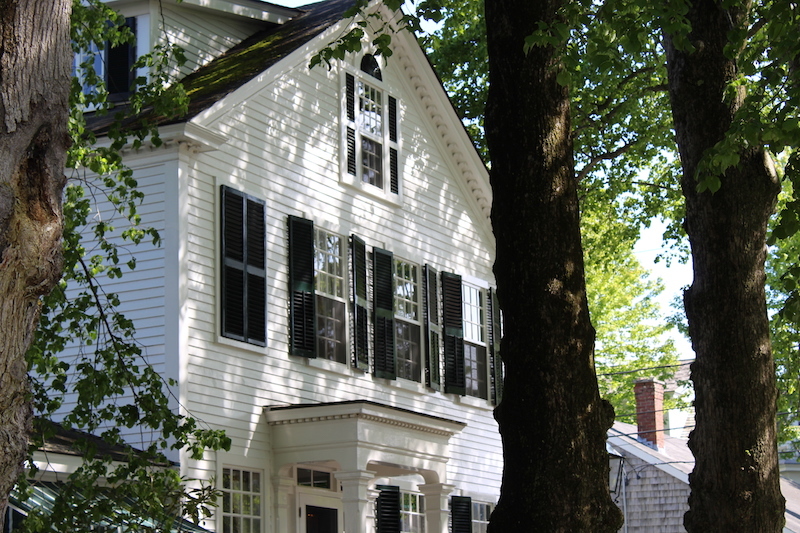 When swung open, louvers on shutters should slope down toward the house, as seen here. That position means that, when swung closed, the louvers would slope away from the window to shed water and provide shade. 3. Ganged or paired windows can pose a shutter positioning challenge. Bi-fold shutters like these are a good option. These are sized and positioned such that when unfolded they could conceivably cover the entire window they serve. 4. Shutters don’t have to be louvered. 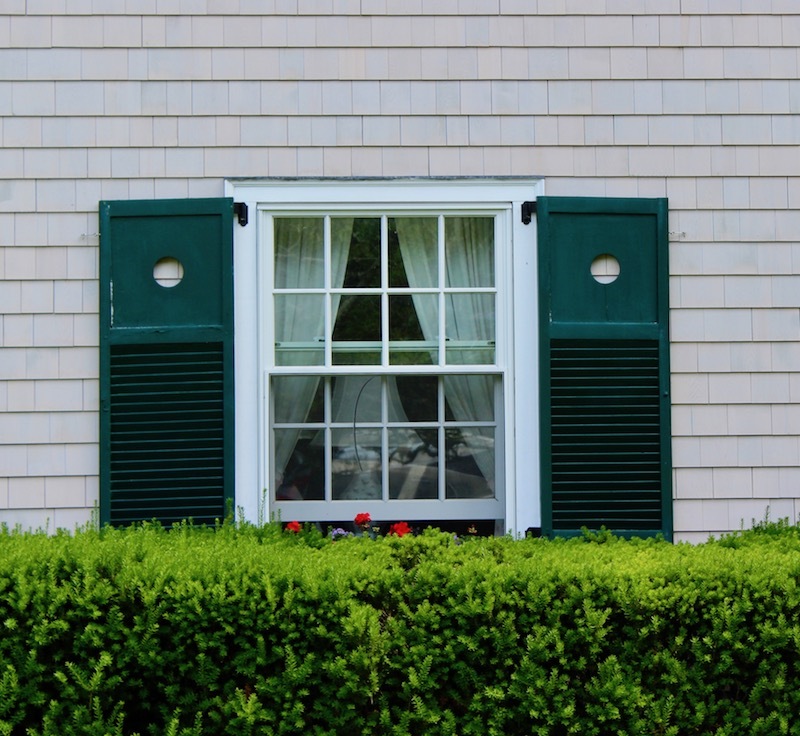 In fact, back in the day, solid shutters often served first-floor windows where security could be a concern. This board shutter is sized to cover the whole window from one side. The color and cutout add charm. A more contemporary take on this shutter might have it mounted to a top track, so it could slide into position. 5. This first-floor pair of red board shutters with miniature tree cutouts amps up the cuteness with color coordinated window muntins. 6. This hybrid shutter offers the best of both worlds. 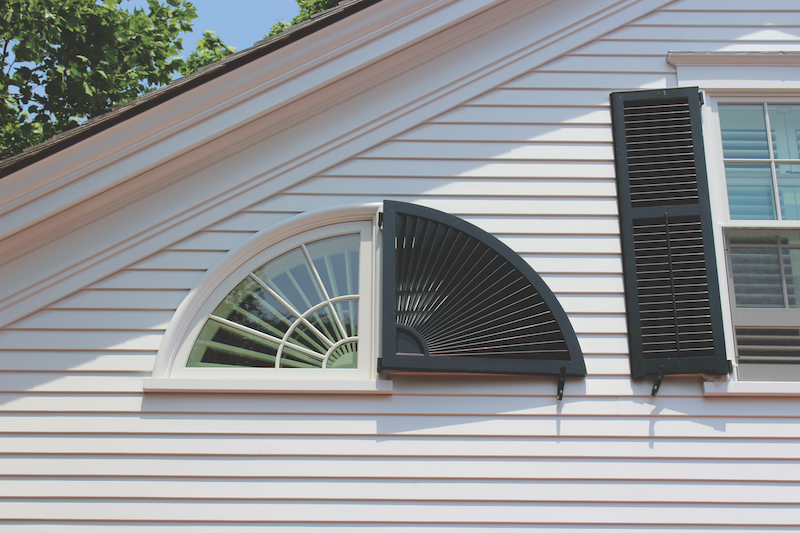 Ventilation louvers roughly correspond to the bottom sash of this open window, and a fixed panel with a peekaboo cutout corresponds to the more often fixed upper sash. Here, you can also catch a glimpse of a traditional surface-mounted pintle that receives the shutter hinge. 7. 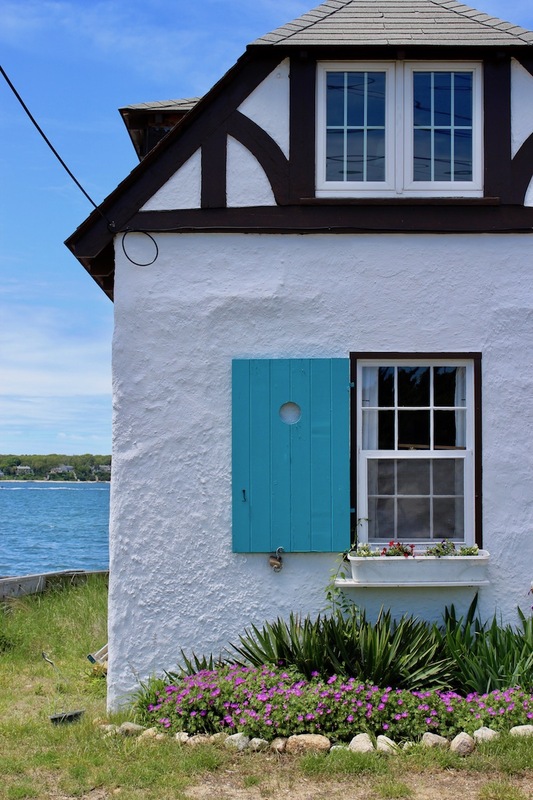 This beautifully crafted quarter-round shutter serves a quarter-round window that is one of a pair of windows that flank a gable-end center window. Notice how the fanning louvers slope down toward the house when the shutter is in the open position, so that, when it’s closed, they slope away from the window to shed water and provide shade. Also note the shutter dogs, tie-backs which keep the shutter from flapping in the wind. 8. 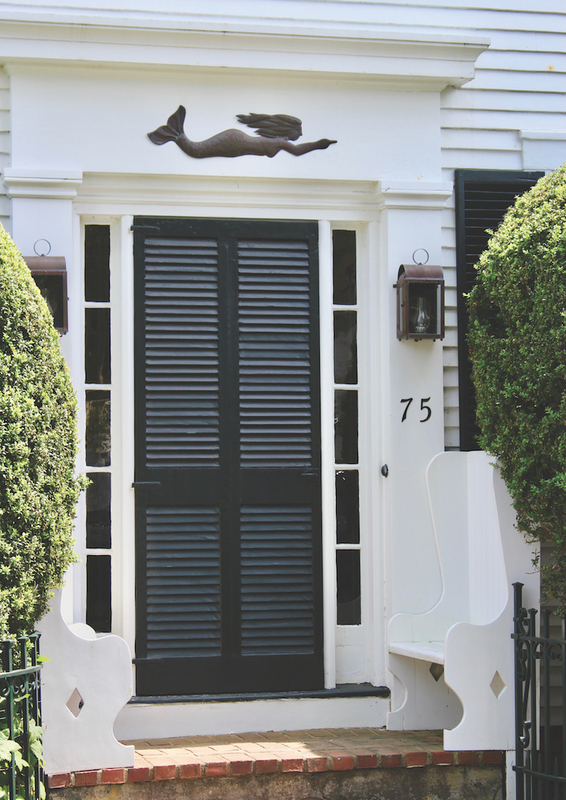 Doors can have shutters, too. When louvered, they’re often called blinds. Like window shutters, they should be sized to completely fill the door opening above the sill and within the casings. Door blinds are a great ventilation option where privacy is a priority, like on a front door.